Includes all transport, tickets to museums, all meals, entry fees for monument and bird sanctuary visits, all kayaking equipment and safety gear. 05.30 pm. Evening tea and snacks in room. 07.30 pm. Dinner at Resort restaurant. 07.30 -10.30 Start Kayaking from Hollant beach and continue kayaking along the coast. Stop on the way at remote hamlets, coves to swim, stretch and relax. See parrot fish and shiny rainbow fish fly thro’ the air and millions of sardines jumping in and about your kayak .If you’re lucky, the dolphins will be alongside, for part of the trip. Watch local fishermen catch fish and crabs. Finish kayaking at Bogmalo beach, close to Resort. 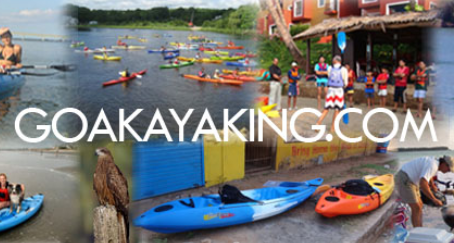 Kayaking on the river Sal from Assolna jetty to Cavolossim, followed by visit to Goa Chitra, museum of Goan artifacts, artisans’ tools, implements, vessels, furniture, crockery, weapons, agricultural implements, jewellery tools, etc. 10.30 am. Return to Resort. 12.00 - 01.30 pm. Nutritious food preparation demo using herbs, etc. 03.30 - 04.30 pm. Yoga, Pranayama, breathing, stretches, etc. Stop on a riverside beach, see the mangroves at close quarters, brahminy kites, migratory cranes, horn bills, comorants, plovers. 08.30 - 10.30 pm. Relaxed dinner/BBQ on the riverbank under the swaying palms. Paddle thro’ the mangroves, variety of birdlife at handshaking distance! See exotic flowering mangrove varieties only found on the rivers, locals catching fish (above)/ crabs from the banks, manual sand extraction from the river bed, ship/boat building activity on the banks, etc. 10.45 - 01.30 pm. Stroll to the Se Cathedral (above) and explore and visit all the churches, monuments and museums. 02.00 - 03.00 pm. Special delicious Goan lunch consisting of locally grown vegetables, herbs, spices. 03.00 - 04.00 pm. Guided tour of the plantation – see exotic spice plants, herbs, cashew, tea, coconut, arecanut, etc. get sprayed/bathed by an elephant! (optional), etc. 01.30 - 03.00 pm. BBQ Buffet (one of Goa’s best!) on the river bank with live bbq stations, live music and boat rides for all. 05.00 - 06.00 pm. Tour of the distillery with feni (local Goan brew distilled from Cashew fruit or Coconut toddy/sap) tasting session for everyone. 06.00 - 07.15 pm. Coach to Mapusa market above -(local goan spicy sausage) –free for shopping etc. 08.15 - 09.00 pm. Free – Stroll in Calangute market, buy souvenirs n gifts for friends and relatives, walk down to Calangute beach. 06.00 - 08.30 pm Free – Walk down to Calngute market, buy souvenirs n gifts for friends and relatives, stroll down to Calangute beach.